Design or customize your own stunning, heirloom-quality barrel carving that shows off your creative vision and the natural beauty of the oak. Made from the finest, hand-selected, thoroughly reconditioned reclaimed French Oak wine barrel heads, beautifully carved and finished. 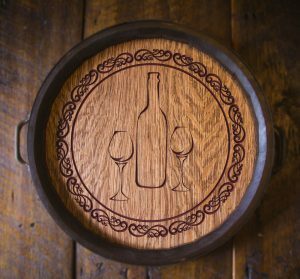 Your wine barrel art carving can be mounted on a table stand made from beautifully finished wine barrel staves with a fine furniture-grade finish to create a tasting table or bistro table that is a great addition to any home or commercial bar, wine cellar or tasting room. These are the finest, most unique wine barrel clocks anywhere – stunningly beautiful AND highly functional works of barrel art. Same design as our barrel carvings with a wide choice of clock faces and the best quality, high torque, quartz clock movements. Our barrel signs are a smaller, less expensive alternative to our flagship barrel carvings. They look like real barrel heads, but are made from scratch from quality, authentic reclaimed materials, and carved & painted to the same high standards. Personalize from our templates. Our lazy susans are both georgeous and practical. Carved with text and artwork of your choice and beautifully finished to show off the quarter-sawn oak. We also offer several choices of round center stones so your lazy susan can double as a cheeseboard or trivet. Our serving trays are totally unique, georgeous and practical. 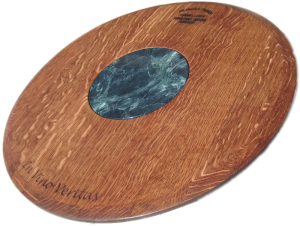 They are made with beautiful authentic materials and are customizable with optional artwork, lazy susan bearing and more. Our handcrafted wine stave signs include your text or graphics beautifully carved, and optionally painted, on selected reclaimed French Oak wine barrel staves, with a wide range of fonts and colors to choose from. They are elegantly finished with fine furniture grade finishes, and selected topcoats for display indoors or out. 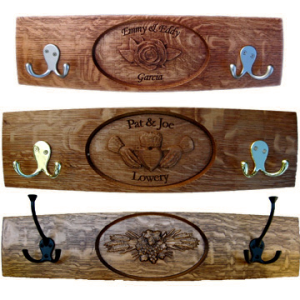 Our handcrafted stave hooks are carved on the curved surface of carefully selected reclaimed French Oak wine barrel staves, with your choice of artwork, fonts and colors. They include your choice of hooks for hanging hats, coats, robes and other items around your business, home, stable or kennel. 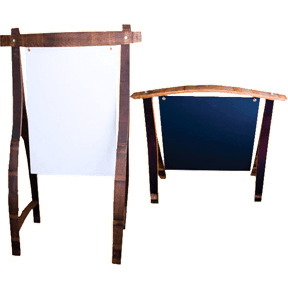 Highly decorative and unique chalkboard easel or whiteboard easel. Two sizes – either perfect for menus, wine tastings, or events. Solidly constructed from recylcled French Oak wine barrel staves. Optionally carved with your custom text and/or logo and finished for use indoor or out. Buy them a gift certificate and remove any risk from giving one of our highly personalized heirloom-quality gifts. Personalize or design any product on our site and hold it for their final approval – OR – let them design their own. A nice printed gift certificate will be mailed to you or your giftee.